This is a completely customized police theme wedding cake topper. Salute to our fellow police officers. No matter what pose you want, what uniform you love, we can replicate them to reflect your career and personality. Check sample image above, policeman figurine with fine details including badge and gun with holster. Besides traditional pose such as standing side by side, we can do more unique police wedding cake topper, like bride cuffing groom or one of the opposite. 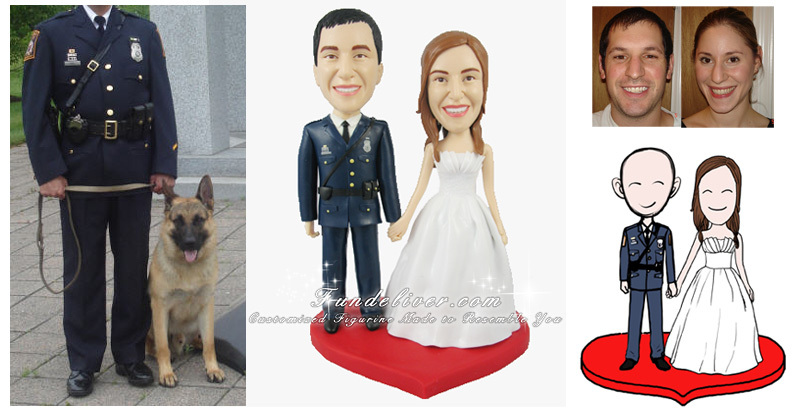 Just tell us what you want, we can make your police cake topper perfect.